Groundbreaking ... for the Lisec service and training centre. 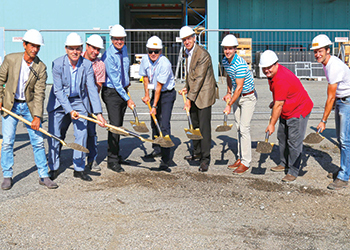 Lisec has broken ground on a new service and training centre at its production site in Seitenstetten, Austria. The group, which leads in the field of glass processing machinery, is investing €2.8 million ($3.17 million) into the globally active service department. The new project will see the construction of a 1,200-sq-m large machine hall and a 950-sq-m office wing. The future exhibition and training hall with state-of-the-art machinery serves for presentation purposes as well as for the training of customers and the service technicians of all subsidiaries, including those in the GCC. In addition, the team for the international service hotline will work from there. “With its finger on the pulse of the time, the new service and training centre that is equipped with the latest infrastructure meets the global requirements of our customers,” explains Peter Rattinger, head of the service department. The new centre is expected to be completed by the year-end and will start operations in January 2016. Based in Amstetten, Austria, Lisec is a globally active group which has been offering innovative individual and overall solutions in the field of processing and refining of flat glass for more than 50 years. Its service portfolio comprises machines, automation solutions and services. In 2013, the group with its approximately 1,500 employees and more than 20 locations generated an aggregate turnover of about €200 million ($226.7 million) with the export market accounting for more than 90 per cent of its business. Lisec develops and produces glass-cutting and sorting systems, individual components and entire production lines for the production of insulating and laminated glass as well as machines for the processing of glass edges and tempering systems. With reliable technology and intelligent automation solutions, the company sets standards in terms of quality and technology and makes a substantial contribution to the success of its customers. The first insulating glass factories set up in Saudi Arabia and Kuwait were supplied by Lisec in 1983, when the company first entered the Middle East market. This was followed by its first supplies to the UAE in 1990. The small Dubai representation facility it set up in 1990 grew to become Lisec’s regional office (Lisec Middle East) in 1999 and is located at the Dubai Airport Free Zone.